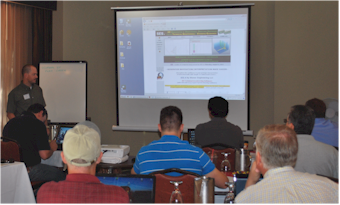 Stoner Engineering hosts formal SES training at The Golden Hotel in Golden, CO. The fee is $995 per person and includes a bound user manual and lunch. Formal SES Training is hands-on-computer detailed instruction. 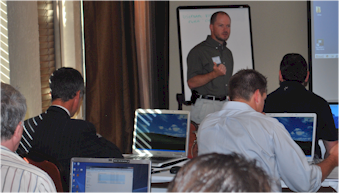 The professional attendee becomes attuned to SES technical geosteering logistics in one day. This training is NOT an introduction to horizontal drilling. An example Formal SES Training agenda is here. Please contact us to register for the training date shown below. With prior notice a laptop for training may be supplied and the attendance fee is $1095. Monday, Jan 20, 2020: OPEN (10 seats remain) RSVP by 2019-12-23. Registration is closed for the following sessions: January 21, 2019; January 15, 2018; April 26, 2017; January 25, 2017; April 27, 2016; January 27, 2016; January 28, 2015; November 12, 2014; August 20, 2014; July 22, 2014; May 21, 2014; April 16, 2014; March 19, 2014; February 26, 2014; January 29, 2014; November 6, 2013; September 4, 2013; August 7, 2013; June 6, 2013; April 4, 2013; March 13, 2013; January 31, 2013; January 10, 2013; November 8, 2012; September 6, 2012; July 19, 2012; June 7, 2012; March 19, 2012; March 1, 2012; December 8, 2011; October 6, 2011; August 4, 2011; June 2, 2011. SES Training Series Videos (70 minutes total). Download raw data files for Training Well #1 and follow-along at your own pace. Also, three additional geosteering example wells including some with sidetracks are part of the SES install and provide geologically diverse payzones for even more guided technical geosteering practice. SES User Manual, including "Geosteering Trade Secrets" chapter. DISCLAIMER: "3RD-PARTY SES TRAINING OPTIONS" listed above are independent business persons and not agents of Stoner Engineering LLC. Stoner Engineering LLC does not accept any responsibility for any representations, statements or contracts made by any independent business persons on this webpage. We recommend thoroughly researching anyone with whom you choose to do business before making final decisions or entering into agreements. Contact us for consideration to become listed here as a 3rd-party option for SES training. Last updated/reaffirmed February 26, 2019.